Friends of my parents gave. My friend, Pat, whom I walk with every morning gave…twice! Once to kick off my fundraising efforts and again as my final push! My boyfriend gave and showed up early in the morning all the way in Wheaton to walk hand in hand with me and side by side with my parents. I was the 4th highest fundraiser! My adult cardiologist was there, not only because she called me lost on her way and I guided her in from Georgia Avenue, but because she, too, is inspired by her patients and their families every single day. My parents were there because they love walking and talking through parkland in Wheaton, Maryland – no, just kidding! They were there and walked together with me like they have all the years of my life. The countless months at Children’s, at doctor’s offices, at labs, in local emergency & waiting rooms, everywhere. Always. My boyfriend, Ja, well, he was there because he “gets it” and he gets me, and understands fully why I’m so passionate about the cause. He stated that he’d walk, not because of the short distance, but rather for the “why”! We had a lot of fun. It was a gorgeous morning, not too chilly, never hot, lots of hills, and a multitude of caring people, patients, parents, families and friends. I am a lucky girl. $1725 was my grand total raised that morning with a total of two-dozen donors in all! So I crashed a girlfriend’s business trip and took off for Vegas the weekend before my birthday! I relaxed at the hotel pool, enjoyed a feast for the eyes & the iPhone camera got a good workout! I took in $63 worth of oatmeal & coffee. I bet on the Nats, I bet on the Yankees. I shared bar space with Carrot Top. I got to spin the wheel & won $8.50 on the Wheel of Fortune machine at Caesar’s Palace! I even ran into my brother-in-law, Joe, also on a business trip. Small world! Needless to say, in the end, I had a lot of fun! Enjoy a few pics here! Lace Up for a Good Cause! 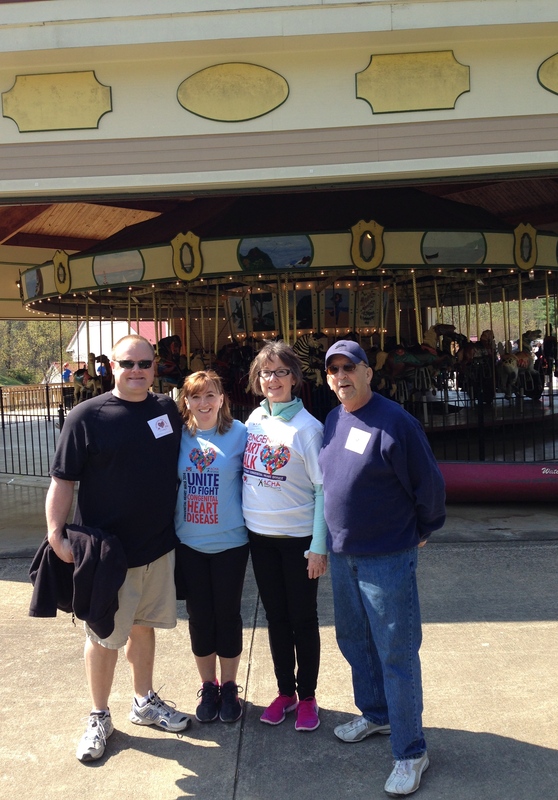 It’s hard to believe that in just ten short days I will have completed another Adult Congenital Heart Walk. This year will be the fourth walk for which I have actively raised funds, and the third I will be able to walk in. We will be back at the Wheaton Regional Park and this time I’m riding on the train AND the merry-go-round afterwards with some of the little ones. Please feel free to join my family and me for this annual event for a good cause very near and dear to my heart – every pun intended. Saturday April 26th is the date. Come celebrate spring with us at Brookside Gardens at Wheaton Regional Park beautifully located at 1800 Glenallen Avenue. 2014 marks 29 years since my last open heart surgery and valve replacement. While I didn’t make it to thirty consecutive years without a repair procedure, I am still a success story and consider myself very blessed and healthy. Many who cared for me most recently from Children’s will walk with us. So…Join us Saturday the 26th or donate today by clicking the link below and stay in your PJ’s that morning. Either way, I appreciate you and am thankful for you and your friendship and continued support from the bottom of my ticker! I gave $10.30 last year as October 30 was the date of my last surgery. Please donate whatever you can. This year I gave $29 for 29 years, but you can give an even $100 or $200 like last year, whatever you want to give is fine, tax-deductible, and will go to support a worthy cause! Pictures from previous walks & why we walk! LES, AGC & her mommy! My proud parents walking with me! My Artificial Mitral Valve: The Ticker!